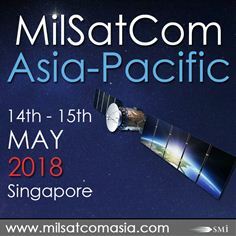 This year’s MilSatCom Asia Pacific conference will be taking place in less than two weeks on 14th and 15th May 2018 in Singapore, featuring a diverse agenda of 15 case study driven presentations from leading Asia Pacific nations, as well as the vital perspectives of strategic partners such as the USA and Canada. The two-day event will provide critical programme updates and will explore the increasing investment in Space and SatCom assets throughout the Asia Pacific region. The conference will focus on protected and tactical requirements facing the region, how capability gaps are cost-effectively being fulfilled through COTS procurement strategies and international cooperation, the utilisation of SatCom assets for civilian purposes in the region such as humanitarian and disaster response, and much more. Beijing Institute of Technology, Canadian Department of Defence, Eur Asian Technology Holdings, Eutelsat, Hughes, Indian Army, Indonesia Maritime Studies, Information and Communications Technology Office (ICT Office), Lockheed Martin Space System Company, Multinational Maritime Security Centre of Excellence, Northern Sky Research, Philippine National Space Programme, Philippines Navy, RAAF Headquarters Air Command, S. Rajaratnam School of International Studies, SES, SES NEW SKIES, Singapore Mindef, Singapore Space & Technology Association, U.S. Air Force, Vietnam Academy of Science and Technology, and many more! Reduced rates are available to Military, Government & Public-Sector representatives.